The Elder Scrolls Online: One Tamriel Arrives Next Week! Get All the Details Here! The Elder Scrolls Online has been a major success for Bethesda Softworks ever since it first launched for the PC and Mac in April 2014. In June 2015, the game made its jump to consoles to widen its audience and fanbase. That will continue later next week, as October 18 will see the console release for the latest update for The Elder Scrolls Online. Update 12 of the game has been dubbed One Tamriel by ZeniMax Online Studios, and this could very well be one of the best updates yet for franchise. Considering the hefty amounts gamers are constantly forced to pay for a season pass or premium pass as of late, sometimes for an amount up to $49.99, it’s nice to see a game such as The Elder Scrolls Online continuing to get free update and free content on a regular basis. As a result, gamers are constantly forced to buy a new game, plus pay almost the complete price of a brand-new game to get the season pass or additional content. Not to mention, the gamers might not get a full and complete experience without buying the extra content. As such, game publishing is becoming a bit of a racket and not very fan-friendly. Not to mention, there are cases of developers and publishers over-promising on games that don’t deliver in the case of game titles such as No Man’s Sky. 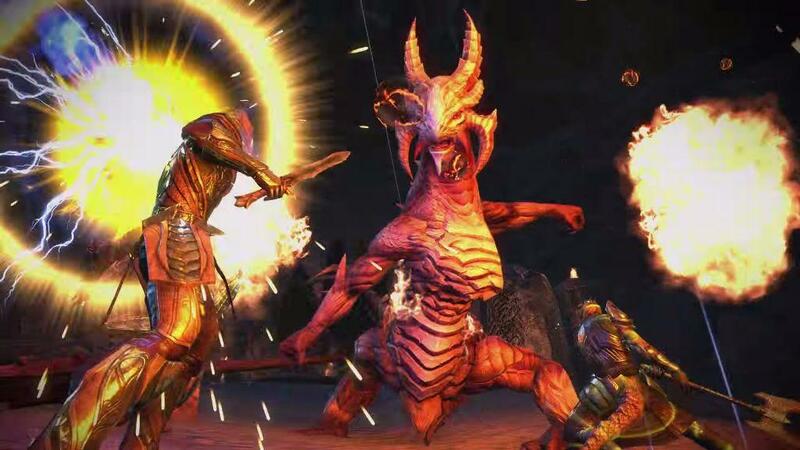 When it comes to The Elder Scrolls Online, ZeniMax Online has delivered a satisfying MMORPG experience on a regular basis. According to a PlayStation Blog post by The Elder Scrolls Online Community Manager, Gina Bruno, the latest update is actually the largest free update that’s ever been released for the massively multiplayer online role-playing game. The update, top-to-bottom, has been built in order to bring the community for Elder Scrolls Online together to go on adventures anywhere in Tamriel. One of the most enticing features that comes with the free update is that gamers will be able to explore and discover any zone in Tamriel in any order they wish. That means players will have the option to visit any area at any level, no matter what alliance or faction they’ve chosen. With this in mind, guilds and factions throughout the game world will be more united than ever for this special open-world format. The Elder Scrolls Online: One Tamriel features a number of other exciting, new features that will likely whet the appetite for fans of the franchise. For example, Craglorn has been completely redesigned, so players can now play solo in the environment, which is still very group-friendly. The Dungeon has been updated, and ZeniMax has now incorporated in Normal and Veteran gameplay modes. 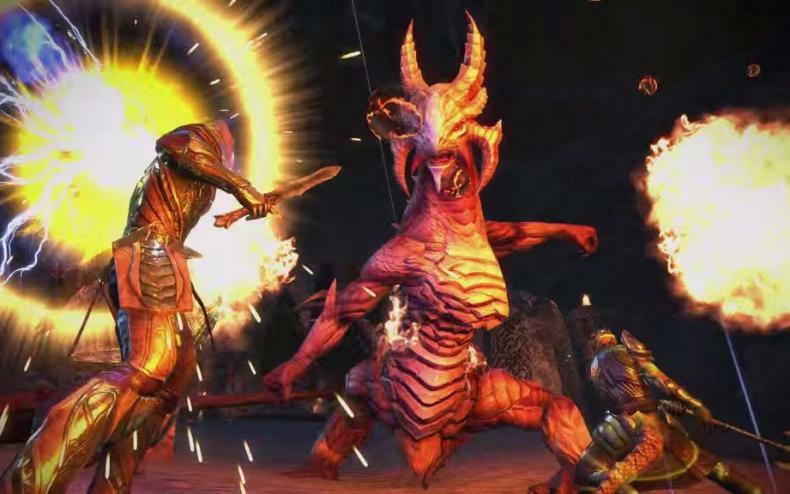 With the Dueling mode, Elder Scrolls Online players can now challenge their friends and rivals in combat. The combat matches are one-on-one to determine who is superior. In terms of weapon combat, ZeniMax has also announced that the game will have new Weapon Ultimates abilities. So players have the option to become a master at their personal weapon and gain new Ultimate abilities for that weapon. Another helpful feature is the addition of Itemization Updates. This handy, new feature will actually scale the level up for various items anywhere the player will travel in the game world of Tamriel. Overall, the One-on-One Combat mode and the free-roaming exploration features sound like the best additions to the update. Essentially, it sounds like One Tamriel will completely unlock the game world to players, giving them more freedom and exploration options than ever before. Just in time for Halloween and the release of One Tamriel, a new holiday event is being rolled out for The Elder Scrolls online that’s called the Witches Festival. This also marks the first major holiday event for the game. The Witches Festival is set to run from October 13 and go through November 1. So it will still run through the launch of One Tamriel next week and through the rest of October and Halloween night. The Witches Festival will be characterized with activities that will net them some “gruesome goodies,” “terrifying treasures” and various in-game achievements. Such rewards for the festival include a Hollowjack crafting motif, unique Provisioning recipes and other in-game rewards. The free exploration provided by the One Tamriel update seems like a great way to enjoy this holiday event for The Elder Scrolls Online event more. The event describes the undead rising from their tombs and spirits stirring in the night. So, this should be a fun event to watch play out in Elder Scrolls Online, especially after the launch of the One Tamriel update. Additionally, while this one be a part of the new update, ZeniMax this week did confirm this week that a new Housing System will be arriving for The Elder Scrolls Online later on. The bad news? This new Housing System won’t appear in-game until early 2017. The good news is that the Housing System for Elder Scrolls Online will be completely revamped, enabling players to own as many housings and dwellings as they want, account-wide. The new Housing System will feature Furniture Crafting, and gamers will even have the option of selling their crafted furniture to other players in-game. Also, players will have the ability to invite friends or guildmates into their humble abodes. The first home gamers will receive with the system will be free, and additional homes can be purchased with gold in the game world. All the houses are built for specific racial styles in the world of Tamriel, and they will come in a variety styles. Hopefully, the wait in 2017 for the new Housing System update won’t be too long. More details on this update are going to be revealed later. The Elder Scrolls Online is available now for Windows PC, OSX, PlayStation 4 and Xbox One. The Free Update 12, aka One Tamriel, is already available as a free download for the PC and MAC versions of the game. One Tamriel then arrives on October 18 for the console versions, and the Witches Festival kicks off on October 13. You can also check out a new trailer for the One Tamriel update in the video player below. Additionally, players who purchase the PlayStation 4 Pro starting in November will be able to enjoy The Elder Scrolls Online, along with Tamriel One, in 4K resolution. Go to the official site to find out more about it!